Arne Duncan gave his final speech as education secretary at St. Sabina Church in Chicago on Wednesday. WASHINGTON — Arne Duncan used his last speech as secretary of education to draw attention to violence that claims the lives of thousands of children each year, saying that the ‘‘greatest frustration’’ of his seven-year tenure has been Washington’s failure to pass gun-control legislation. Fighting off tears, Duncan said that 16,000 young people were killed during his first six years in office. ‘‘We have to get guns out of the wrong people’s hands. We have to make sure our babies are safe,’’ said Duncan, who plans to step down Thursday. He went on to draw connections between street violence and high school dropout rates in America’s poorest communities, saying that both are the result of hopelessness that children feel when they grow up believing that they have a better chance of dying young than going to college or getting a job. The country could save lives with a new ‘‘new deal’’ for kids, he said, that would provide broad access to preschool and meaningful incentives for great teachers to work in high-poverty schools, as well as mentorship and support for job creation in poor neighborhoods. ‘‘Our children need hope, and hope not in the unseen, not in the distance, but in what they can see every day on their block and in their schools and in their communities,’’ Duncan said. 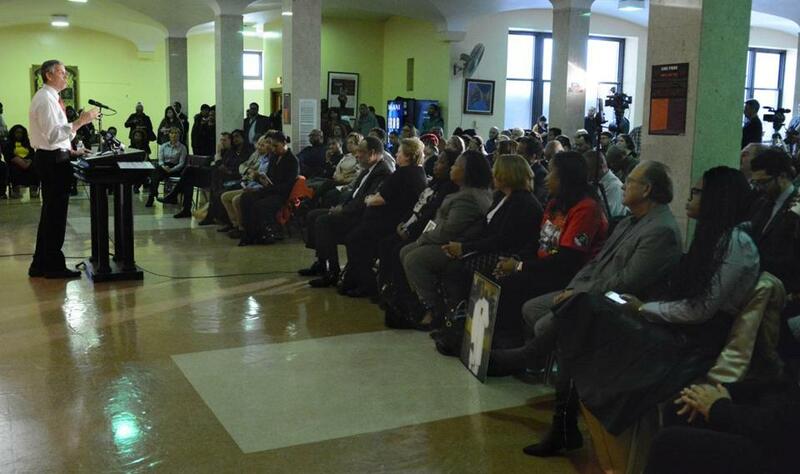 Duncan delivered the address in his home town of Chicago in the basement of Saint Sabina, a South Side Catholic church known for its social justice and civil rights activism. He was introduced by Chicago native Christina Waters, who was the victim of a random shooting at a church social in 2009, shortly after she graduated from high school. Waters, who has known Duncan since elementary school and considers him a mentor, was lucky: She recovered and now attends Sam Houston University in Texas, from which she expects to graduate in 2017. Duncan said the nation should be moved to act by her story and the stories of children like her who were victims of violence and were not so lucky. So far this year, there have been 480 homicides in Chicago, up from 435 in 2014, according to the Chicago Tribune. It is one of several cities that have seen a spike in violent crime in 2015. It is also one of many cities where police officers’ fatal shootings of young black males have led to public outrage. Mayor Rahm Emanuel (D) has faced calls that he resign for his handling of the death of 17-year-old Laquan McDonald. It took 13 months and a court order for the city to release footage from a police car’s dashboard camera showing how McDonald died: shot 16 times while running away from police. But fixing police departments will go only so far toward stemming the violence, he said, ‘‘if we don’t fix the communities where so many of our children are dying.’’ And while there are exemplary programs in many places, they don’t reach enough kids, he said. ‘‘What we don’t have anywhere is scale, is critical mass,’’ he said. Duncan has been one of the nation’s longest-serving and most influential education secretaries, using a windfall of billions in federal stimulus dollars to encourage states to adopt policies that he favored, including new Common Core academic standards and teacher evaluations tied to test scores. His push led to a backlash from Congress, which just passed a new federal education law that scales back the role of the federal government in K-12 education. During Duncan’s tenure, the Education Department has also defined campus sexual assault as a civil rights issue, opening investigations into the handling of assault at more than 100 colleges and universities and dozens of K-12 districts. A longtime friend of President Obama and one of his longest-serving Cabinet members, Duncan announced in October that he would step down at the end of the year to join his family in Chicago. Duncan has not said what he plans to do next. ‘‘I haven’t had time or honestly the emotional capacity to think about it,’’ he told The Washington Post in an interview earlier this month. But he said that working to combat violence in his hometown and nationwide would certainly be part of whatever he chooses to take on. Asked Wednesday whether he plans to run for public office, he said he has no plans to.